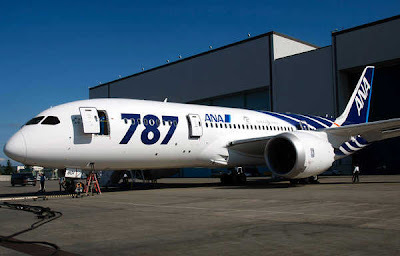 ANA on track for first 787 ever! The first ANA 787 commercial flight is a “charter flight” on October 26, from Narita to Hong Kong (and return). 100 Economy passengers will be on board, chosen by lottery from people who book on the ANA website. Business class seats will be sold by auction with proceeds going to charity. You can win a seat too. See my post from last Friday. This will be followed by some excursion flights on October 28 and 29 from Narita – to Narita. The first commercial flight will take place on November 1 on a domestic route from Tokyo’s Haneda airport to Okayama and onto Hiroshima.